Have you seen those neon orange fake pumpkins and nearly vomited because you wouldn’t dream of decorating with them. I mean, get real, everyone would know they were fake. Ah ha, but have you seen the price tags? $1 – $6? For that price you might just be willing to take a leap of faith with me, wouldn’t you? Awesome, because I’m going to show you how to faux paint a fake pumpkin so you can decorate with them year after year and fool your friends. 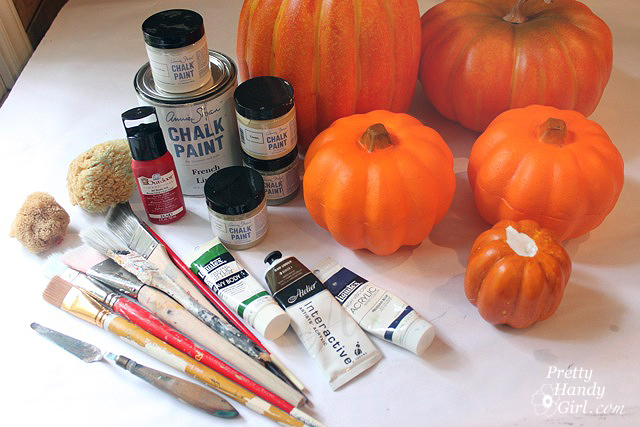 Start by painting all the pumpkins with Chalk Paint (use gray, white, green and blue paint.) Allow the pumpkins to dry. It helps to look up some pictures of real pumpkins to refer to. Using the stencil brush, paint a mixture of grey and white on one of the pumpkins. Dip the stencil brush into the white paint and add paint on the outer most bumps on the pumpkins. This is adding highlights. Dab the highlights gently with the sea sponge to blend. 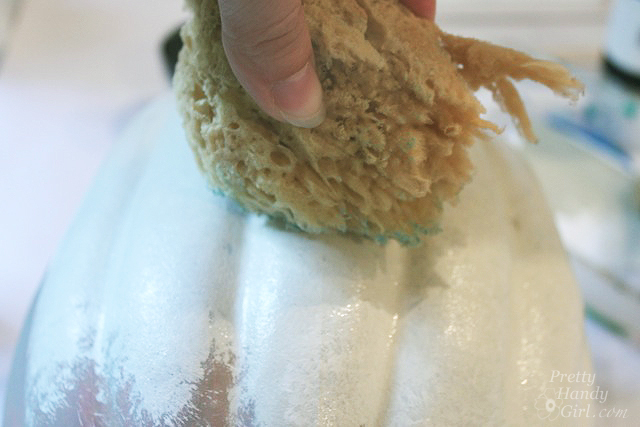 Use the fan brush dipped in a small amount of green paint inside the pumpkin ridges. Dab the ridges with the sea sponge to blend. Have you ever seen a truly unblemished pumpkin? I think not. It’s time to add some spots or marks on the pumpkin to truly fool your friends. Dip the end of the paint brush into brown paint and dot it onto the pumpkin. Blot the spot with a sea sponge and maybe even transfer a few new spots with the sponge. Paint grey around the base of the stem and into the grooves with the round paint brush. Paint brown and green paint onto the pumpkin stem. Blend slightly with the sea sponge. Can you spot my fake white pumpkin? Well, of course you can because I just showed you how to paint it. But, it will definitely fool your friends! Painting blue pumpkins uses the same technique as painting the white pumpkins, only using a few different colors. Use the stencil brush to paint blue onto another pumpkin. Dab the blue paint while it’s still wet with the sea sponge. Use the fan brush dipped in gray and brown craft paint to fill in the ridges. Dab the paint with the dry sea sponge to blend. Add some highlights with a mixture of grey and white. This serves two purposes. 1) It adds dimension. 2) It tones down the excess blue on the pumpkin. Paint the stem the same way you learned above. 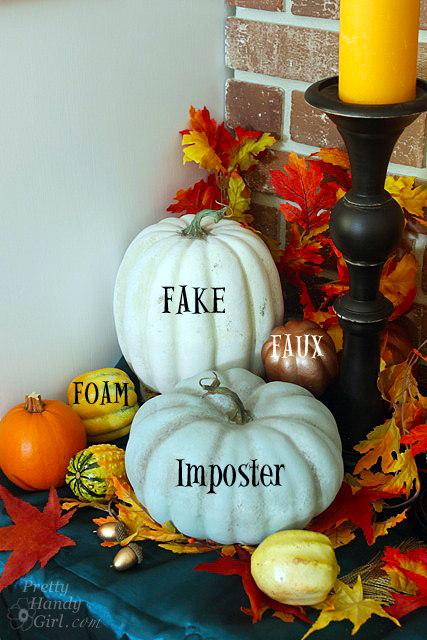 To truly fool people, set up your fake pumpkins with some real pumpkins and real gourds. Sooo, can you spot the fakes? How many did you get right? The metallic gourd is simply spray-painted with copper spray paint. But, I did try my hand at faking a green and yellow gourd using the same technique as the pumpkins, but adding green to the top and yellow to the bottom. How did you do this time? Ha, you can now apply for a job as an art forgery detective ;-). Now seriously, how many people will be viewing your pumpkins that close? Umm, next to no one. Normally they’ll view them from afar. Get your paints and palette out and go fake some fakes! It will be our little secret. Or if you’re feeling like taking on a larger scale project…how about Faux painted bricks! Those pumpkins are incredible! I’m not one to do the artsy thing, but I know people who are and will pass this on. Thanks. Awesomeness! I have a faker sitting in my garage right now, and a ton of paint…whoop! Thanks, Corinna. I don’t have any Annie Sloan leftovers, either! Corinna, that is a great point! Thanks for sharing your frugal supplies! Love your pumpkins BTW. nicely done and the chalk paint probably also provides a finish similar to the real thing! Yours look so real! I need to try the sponge method. I just painted mine straight up and didn’t do an fancy texturing. I think the sponging or speckling makes all the difference.